Pakistan is in the throes of a judicial crisis since March 2007. On March 09, 2007, general Pervez Mussharraf summoned chief justice Muhammad Iftikhar Chaudry to army house. He was asked some tough questions and then asked to resign. Chief justice held his ground and refused. He was kept at army house for several hours so that an acting chief justice could be sworn in. Justice Javed Iqbal was sworn in as the senior most judge justice Rana Baghwan Das was out of country. Chaudry was given the title of ‘suspended’ chief justice and his case referred to Supreme Judicial Council (SJC) for action. This started a crisis where majority of the people denounced the cavalier manner in which general Mussharraf dealt with the chief justice. Legal community fully supported chief justice by boycotting courts and bringing out processions on the streets. Now every one is waiting for the final scene of the drama which may take a while. Current crisis has brought judiciary in the lime light. This article will give a historical overview of the role of judiciary in Pakistan and its interaction with both civilian and military rulers. In every country, there is a continuous struggle for accumulating more power between different state institutions. Executive tries to get a free hand and does not like legal restraints. Judiciary tries to put some breaks on unchecked powers of the executive. This struggle keeps some semblance of balance of power. However, a politicized judiciary is as dangerous as an uncontrolled power hungry executive. Pakistan started on a sound footing as far as judiciary was concerned. Judiciary was deeply rooted in British judicial traditions. General public had great respect for the judiciary and while lengthy process of trials was dreaded, judges were held in high esteem as they were seen as fair in their judgments. The first Pakistani chief justice Sir Abdul Rasheed refused to socialize with Prime Minister Liaqat Ali Khan to avoid any misperception that judiciary will favor executive in certain circumstances. In 1954, Sindh chief court (later named high court) headed by chief judge (later designated chief justice) Sir George Constantine reversed Governor General’s order of dissolution of Constituent Assembly. Later several justices tried to maintain the independence of judiciary and resisted the pressures and temptations of the executive branch. However such cases were few. In 1999 when Supreme Court was hearing the case of establishment of military courts by Nawaz Sharif government, chief justice Ajmal Mian declined to meet prime minister and governor of Sindh Lt. General ® Moinuddin Haider who contacted him to visit him for Eid greetings. Executive and judiciary function in their own spheres but sometimes their interests clash. Executive tries to have some kind of control on the function of judiciary especially when its interests are challenged. Executive tries to influence judiciary through favors in postings, promotions and post-retirement benefits. Troublesome justices are mostly retired using administrative loopholes but occasionally more severe action is taken against the stubborn judge. Former Prime Minister Zulfiqar A. Bhutto was awarded death sentence by Lahore high court for ordering the murder of a political opponent. An appeal against the judgment was filed in the Supreme Court. The initial bench of nine judges (Anwar ul Haq, Muhammad Akram, Dorab Patel, Muhammad Haleem, Nasim Hasan Shah, Ghulam Safdar Shah, Karam Elahi Chauhan, Waheedudin Ahmad and Qaisar Khan) started to hear appeal. During the hearing, Qaisar Khan retired and Waheedudin Ahmad got ill. Remaining seven judges heard the case and rejected the appeal in a four to three decision on February 02, 1979. Justice Ghulam Safdar Shah was one of the dissenting judges (the other two were Muhammad Halim and Dorab Patel). He later gave a statement which gave the impression of his inclination to accept the argument of Bhutto’s defense team. This caused great apprehension and General Zia ordered director of Federal Investigations Agency (FIA) to inquire about Safdar Shah’s credentials. Government found many discrepancies and approached chief justice for action against the judge. The case was referred to Supreme Judicial Council (SJC) and Safdar Shah was forced to resign and hounded out of country. (3) Military government set a good example for the rest of the judiciary and showed that it can hurt justices who cross the line. Prior to this incident, references have been filed against four other justices: Justice Hasan Ali Agha in 1951 (he was later exonerated), Justice Akhlaq Hussain in 1960 (he was removed) and justices Shaikh Shaukat Ali and Fazal Ghani in 1969 (both of them resigned). During direct military rule, conflict between military justice system and civilian courts in inevitable. In case of Pakistan, higher judiciary has given legal cover to military rule, however even complaint judges sometimes find it very difficult to completely set aside fundamental judicial principles. This creates the rift and shuffling of judges is usually the norm during military rule. (4) There has been no large scale protest or judicial activity during various military governments. Higher courts have given some belated verdicts after the departure of the ruler which has no relevance. General Yahya Khan was forced to relinquish his office after the separation of East Pakistan in December 1971. Supreme Court belatedly ruled on April 07, 1972 that general Yahya Khan was a usurper. Some justices even went back to declare that President Iskandar Mirza and General Ayub Khan had committed treason when they suspended civilian rule in 1958. 1989, Zia dismissed Prime Minister Muhammad Khan Junejo’s government. Zia died in a mysterious aero plane crash in August 1989. Members of the dissolved assembly challenged the decision. High courts and Supreme Court dismissed several of those petitions. In one case, Federation of Pakistan vs. Saifullah Khan, Supreme Court ruled that General Zia’s decision was unconstitutional but refused to restore the National Assembly. The reason for court’s refusal of restoration of assembly came to light three years later. Former Army Chief General Mirza Aslam Beg in an interview on February 04, 1993 admitted that he had sent an emissary, then senate chairman Wasim Sajjad to the Supreme Court to warn the justices not to restore the national assembly. Two weeks later, Supreme Court charged General Beg with contempt of court. Beg met with army Chief Abdul Waheed Kakar and later appeared defiantly in the court and many witnesses ridiculed the judges. Supreme Court could not handle the fallout from its confrontation with even a retired army chief. Court finally convicted him of contempt but strangely did not give any judgment about the sentence. The same court even overturned its own decision after an appeal was filed. After a year of half hearted measures, on January 09, 1994 the court dropped all proceedings against general Beg. In October 1958, when President Iskandar Mirza abrogated the constitution and declared Martial Law, Chief Justice Muhammad Munir helped Mirza and army chief General Ayub Khan in legal affairs. The very next day, Munir attended a meeting and gave Ayub Khan his ideas about a new constitution. Immediately after 1977 coup, General Zia contacted chief justice Muhammad Yaqub Ali who advised him that constitution should be held in abeyance. (5) Zia also made chief justices of high courts governors of their respective provinces. Zia was not sure how Yaqub was going to rule on the pending petition of Mrs. Nusrat Bhutto challenging Zia’s martial law and overthrow of her husband’s government. Yaqub was removed on September 22, 1997 by a curious method. Zia amended the constitution by withdrawing the Sixth Amendment (which had given Yaqub extension of his service) and Yaqub was out the door. Barely two months later on November 10, 1977, the new chief justice Anwarul Haq gave the expected decision of validating Zia’s martial law. During his eleven year rule, Zia avoided to appoint permanent chief justices of high courts. Chief justices functioned on acting basis for long period of time and many were confirmed and made permanent only very close to their dates of retirements. An acting chief justice is much easier to move or remove than a permanent one if government feels that he may give a judgment which can harm government’s position. In Pakistan, during military rule, constitution is usually amended to give legal cover to military decisions. In 1981, Zia promulgated Provisional Constitutional Order (PCO) and asked judges of the higher courts to take fresh oaths. This opportunity was used to sideline unwanted lot of judges. Fourteen judges were not offered the oath while three judges refused to take fresh oath resulting in retirement of seventeen judges in one shot. Two decades later, General Pervez Mussharraf adopted the same course. On October 12, 1999, General Mussharraf dismissed Nawaz Sharif government and took control of the country’s affairs. In January 2000, judges were asked to take a fresh oath under Provisional Constitutional Order (PCO). PCO prevented courts from hearing any appeals against the actions of the military government. Government took advantage of this opportunity and some judges were not asked to take oath thus automatically sideling them while others refused to take fresh oath. In January 2002, Lahore high court was scheduled to start regular hearing of an appeal filed by sacked Prime Minister Nawaz Sharif challenging General Mussharraf’s coup. On January 26, 2000, General Musharraf issued PCO to remove the jurisdiction of civilian courts in certain affairs. This was considered essential to give legal cover to decisions made by military rulers. Judges of superior courts had to take a fresh oath under PCO and anyone who was not offered to take oath or who refused stood retired. A day earlier, General Musharraf met with chief justice Saeeduzaman Siddiqi and asked him to take fresh oath under PCO but chief justice declined. Later that night, two serving generals and one retired general visited chief justice again and asked him to re-consider his decision but he again declined. Early in the morning, a colonel came to chief justice's house asking him not to go to Supreme Court while his house was being cordoned off. Eighteen judges of superior courts; six judges of Supreme Court including chief justice, six of Sindh high court and four of North West Frontier Province (N.W.F.P.) and two of Punjab high court stood retired by this action. New judges were inducted to fill these positions. Four months later, the new bench of Supreme Court headed by a new chief justice (Irshad Hasan Khan) validated general Mussharraf's coup. Supreme Court also gave general Musharraf the sweeping authority to amend the constitution, although none of the parties before the court sought court's advice on this issue. (6) General Musharraf paid back the judges by a 30% increase of their salaries. Out of 12 judges of Supreme Court who legalized the coup, six were given three-year extension of their service. Three judges were given new lucrative assignments after retirement. In addition, military government increased the retirement age of judges of Supreme Court from 65 to 68 and those of high courts from 62 to 65. Thirty-seven judges of higher courts benefited from this three-year increase in their retirement age. (7) Later, court has given its opinion on several constitutional issues arising from general Mussharraf’s rule. In April 2005, a five member Supreme Court bench headed by chief justice Nazim Hussain Siddiqi rejected the petitions challenging the constitutionality of general Mussharraf holding the dual office of army chief and president of the country. Since general Mussharraf’s ascent to power in October 1999, country has seen eight chief justices of the Supreme Court. In the last few months chief justice Iftikhar Muhammad Chaudry got involved in some decisions which caused discomfort in the government’s quarters. He had cancelled the privatization of Karachi Steel Mills and construction of a golf club at a public park in Islamabad. He had also started entertaining petitions from families of missing persons believed to be picked up by intelligence agencies. He had a meeting with Director General of Inter Service Intelligence (DG ISI) and used some harsh language. Later, DG ISI had a meeting with General Mussharraf and allegedly told him that ‘your chief justice not only wants to run judicial affairs but now wants to run national security affairs’. On February 16, 2007, Naeem Bukhari, a senior attorney of Supreme Court wrote a letter condemning the attitude and behavior of chief justice and his treatment of lawyers in the court. He sent the letter to senior lawyers and various bar associations of the country. (8) Many lawyers agreed with Bukhari’s assessment and no one objected, however no one expected that General Mussharraf will send chief justice home. On March 09, General Mussharraf summoned chief justice to his office and in a brief encounter handed him the list of his misdeeds and asked him to resign. Prime Minister Shaukat Aziz also met with chief justice and told him that government, military and ‘brother judges’ of supreme court were all in agreement about his ouster. After a brief encounter with Mussharraf, chief justice was kept at the place for few hours during which time, senior intelligence officers explained charges against him. Chaudry managed to get out without resigning and immediately contacted some of his close lawyer friends. His calls were being monitored and government decided to confine him to his house. (9) Chaudry was kept at president’s office until acting chief justice Javed Iqbal was sworn in. President also issued an order of restraint of chief justice to avoid any potential of mischief on part of chief justice. He referred the case of misconduct of chief justice to Supreme Judicial Council (SJC). The response of general public and lawyer community was very negative and soon everybody was denouncing president’s arbitrary decision. Government had not expected such an outpour of sympathy for the restrained chief justice. General Mussharraf overplayed his hand when he had intelligence officials go over the details of Chaudry’s misdeeds. Chaudry after all is a legal mind and after seeing all the evidence showed to him by intelligence officials quickly realized that this evidence may not stand in SJC and opted for a showdown. It appears that legal wizard Shareefuddin Peerzada was not consulted prior to Mussharraf’s encounter with Chaudry. Military mind works on surprise and very small group of close confidants was privy to this decision. In addition, intriguing atmosphere, whispering, paranoia and staunch belief in conspiracy theories at the highest echelon of power in Islamabad is not conducive for an in house frank discussion prior to implementation of important decisions. General Mussharraf and his advisors on this matter fumbled with ‘suspension’ and ‘restraint’ of the chief justice. The order of ‘restraint’ was initially issued against the chief justice. However, later when Peerzada came into picture and informed the amateurs that president can not restrain a justice; chief justice was sent on a ‘forced leave’, a clause inserted during general Yahya Khan rule (1969-71). Supreme Judicial Council (SJC) consisting of five judges (two justices from supreme court, two chief justices of high courts and acting chief justice are members of SJC) headed by acting chief justice Rana Baghwandas started to hear the reference of misconduct against chief justice. Chaudry filed a constitutional petition asking a full court to hear his case rather than SJC. However, he asked that all senior judges who may benefit from his removal should be excluded. Acting chief justice constituted a five member bench of junior judges to hear Chaudry’s case. Government alarmed by this move filed a petition asking that a full court should hear the case. Veteran lawyer Shareefuddin Peerzada is on president’s team and he the question that only five junior judges including an ad hoc judge are hearing an important case while seven senior judges have been excluded. The five member bench halted proceedings of SJC and recommended a full court hearing of Chaudry’s case. Acting chief justice constituted a 14 member full bench to hear the petition excluding himself and three other justices (Abdul Hameed Dogar, Javed Iqbal and Sardar Muhammad Raza Khan). One of the member justice Falak Sher excused himself and bench was reconstituted with thirteen members. This bench headed by justice Khalil ur Rahman Ramday is now hearing the case of chief justice. Civilian leaders when in power try to gather maximum power and politicians of all persuasions have tried to either undermine judiciary or fill it with sympathetic judges to get desired results. Zulfiqar Ali Bhutto, the first civilian leader who had firm control over all affairs was instrumental in passing of the 1973 constitution. However, succumbing to his own authoritarian bent, he also managed to amend the constitution. Several amendments of 1973 constitution were related to judiciary. The Fourth Amendment of November 25, 1975 was related to preventive detention and power of high courts was restricted in this respect. Fifth Amendment of September 15, 1976 had several components to give executive leverage against judiciary. This amendment also fixed the tenure of chief justices of higher courts (Four years for high courts and five years for Supreme Court). It also gave executive the power to transfer a high court judge without his consent or consultation of chief justice. Executive could appoint a high court judge as puisne judge of supreme court and if he did not agree to his elevation he would automatically stand retired. When chief justice Yaqub Ali’s time came for retirement, constitution was conveniently amended (Sixth Amendment) which allowed chief justice to hold office for the proscribed term even if he have attained the retirement age. Civilian leaders have used all available means both fair and foul to prevent encroachment of judiciary which they perceive as their turf or to get desired judgments. In early 1993, relations between Prime Minister Nawaz Sharif and president Ghulam Ishaque Khan deteriorated quite rapidly and Khan was planning to ouster Sharif. Some statements attributed to chief justice Muhammad Afzal Zullah indicated that judiciary may act to counter president’s move. President waited till 18 April 1993; the day of retirement of chief justice. In a very curious development, chief justice on the very day of his retirement was on a plane heading out of country. Justice Nasim Hasan Shah was sworn in as acting chief justice; another curious move as he should have been appointed permanent chief justice. President dropped his guillotine on the same day sending Sharif and assembly packing home. When Sajjad A. Shah became chief justice, he had cordial relations with Benazir. Shah after assuming office agreed to government’s suggestion of appointing acting and ad hoc judges to Supreme Court and some of these nominees were retired judges. This move had been resisted by previous acting chief justice Sad Saud Jan. Seven justices (Zia M. Mirza, Fazal Karim, Munir Khan, Muhammad Ilyas, Mir Hazar Khan Khoso, Mukhtar A. Junejo and Irshad Hasan Khan) were appointed in this manner. The judgment of first political case decided on October 1994 by this new court showed where the court was heading. The case was of North West Frontier Province (N.W.F.P.) provincial assembly’s in house change by defection of two members where opposition provincial government had been replaced by People’s Party government headed by Aftab Ahmad Khan Sherpao. The ousted chief minister Pir Sabir Shah had approached the court. Supreme Court in a seven to five judgment rejected the petition. All judges who sided with chief justice’s view were those inducted in the last four months by Shah while all five permanent judges held the minority view. (11) Governments favor some judges for one reason or another and then expect that these judges will be acting as their agents in judiciary. However, there are some limits to how much judges can oblige. This was the main reason for deterioration of relations between Sajjad A. Shah and Benazir. When Benazir government was dismissed second time on November 05, 1996, governors of Punjab and N.W.F.P. provinces considered Benazir loyalists were removed and chief justices of high courts were sworn in as acting governors. President Farooq Ahmad Leghari pressurized these two justices turned acting governors to dissolve provincial assemblies and assured them that if they resigned from judiciary they would be retained as permanent governors. (12) President Muhammad Rafiq Tarar had the audacity to meet chief justice Ajmal Mian in his chamber at Supreme Court and ask him not to appoint Justice Falak Sher as acting chief justice of Lahore high court as government did not like him. Chief justice declined but government went ahead and nominated a junior justice Allah Nawaz as acting chief justice. (13) During her second term, Benazir Bhutto had appointed Sajjad Ali Shah chief justice over the head of three senior justices. She thought that Shah would return the favor. When tensions rose between chief justice and Benazir about the issue of appointment of some judges, government decided to strike back. First, former Sindh chief minister Qaim Ali Shah spilled the beans in a newspaper. He claimed that he had persuaded Benazir during her first term to elevate Sajjad to the post of chief justice of Sindh high court. In the second term, Benazir didn’t want to elevate Sajjad to the post of chief justice of supreme court but he along with Sindh chief minister Abdullah Shah and defense minister Aftab Shaban Mirani (all Sindhis) persuaded Benzair to appoint Sajjad A. Shah. (14) In the judge’s case, Supreme Court had ruled that senior most judge should be considered for appointment if there is no valid negative element against him. Government decided to beat chief justice with his own stick and now filed a review petition asking the court whether the rule of seniority applied to chief justice of the Supreme Court (referring to Shah’s elevation against the rule of seniority). Counsel for federation raised objection to Shah heading the bench to decide about his own appointment. Shah refused the request and continued to preside the bench and federal government withdrew the petition. Government also started to harass chief justice and his family. Several incidents such as snatching of one of the car used by chief justice at gun point and arrest of an armed intruder from his residence (police claimed that the man was mentally disturbed) raised suspicion about harassment. His son-in-law and other relatives were sacked from their jobs and police harassed them. During Nawaz Sharif’s first term, special courts were set up to prosecute certain crimes. A Supreme Appellate Court was set up to streamline appeal process and a supreme court judge was assigned to this court. When justice Sajjad Ali Shah sitting on this court acquitted one accused, Sharif was furious. He persuaded chief justice to remove Sajjad A. Shah and appoint justice Muhammad Rafiq Tarar (a Sharif loyalist). One example will show the modus operandi for the selection and appointment of the highest judicial authority of the country. In 1994, when Benazir decided to appoint Sajjad A. Shah as chief justice superceding three senior justices, she asked the intelligence agencies about the possible reaction from legal community. Shah was in Karachi sitting in his court hearing cases when law secretary (Justice Shaikh Riaz Ahmad) called him and asked him a curious question of what kind of dress he was wearing. Shah replied that he was in court therefore wearing official dress (Shirwani). Shah was told to head to the airport immediately without informing anyone and wait for next message. At airport, Shah boarded a special plane sent from Islamabad and on landing in Islamabad; he was taken to the president house where he met president and prime minister. He was then informed that he was being elevated to the office of chief justice and he took oath. When Shah developed differences with Benazir, she tried to cultivate other justices of the court. Benazir approached senior most judge of the supreme court, justice Ajmal Mian through a family friend Dr. Asim. Asim conveyed the message to Mian that Benazir was sorry that she appointed Sajjad A. Shah as chief justice and wanted to discuss the matter with him. Mian declined to meet Benazir secretly. She again approached Mian through Attorney General Qazi Muhammad Jamil suggesting that Mian should take up the case of appointment of Sajjad A. Shah while Shah was out of country. (15) Prime Minister of the country was encouraging a Supreme Court justice to act against his own chief justice. Such efforts damaged both the executive and the judiciary. The judicial crisis of 1997 severely damaged country’s image and judiciary’s reputation. A reckless civilian prime minister and his cronies clashed head on with an equally reckless chief justice of the supreme court. A number of judges of supreme court openly rebelled against their own chief justice thus bringing the judiciary to new low levels. The saga of Byzantine intrigues was played at the highest levels making the country a laughing stock. The trouble between judges of supreme court had been brewing over a long time. In 1993, justice Sajjad A. Shah gave the lone dissenting opinion when Supreme Court restored Sharif government by a majority decision. Two judges; Muhammad Rafiq Tarar and Saeeduzzaman Siddiqi asked chief justice Nasim Hasan Shah to take disciplinary action against Sajjad A. Shah for the language he used in his dissenting note. (16) Chief justice didn’t take any action against Sajjad A. Shah but it caused a permanent rift. Supreme Court takes recess during summer vacations and if chief justice is out of country during recess it is not necessary to appoint an acting chief justice. In the summer of 1997, chief justice Sajjad A. Shah proceeded to an overseas trip. Incidentally second senior most justice Ajmal Mian was also abroad. Justice Saeeduzaman Siddiqi was in Islamabad when he was told that chief justice had left the country. He adjourned the proceedings, consulted lawyers and then called all supreme court registries to stop working. He declared that there was a constitutional crisis since no acting chief justice was appointed. He sent a letter to the federal government advising it to issue notification for appointment of acting chief justice. As he was the next senior judge, he was appointed acting chief justice. This caused a lot of bad blood between Saeeduzaman Siddiqi and Sajjad A. Shah and on his return Sajjad A. Shah conveyed his disapproval in writing. On October 09, 1997, chief justice went to Saudi Arabia and justice Ajmal Mian was sworn as acting chief justice. Mian spilled the beans on the same day he took oath. He told the press that Sajjad A. Shah had not consulted the judges for appointment of additional judges and that a full court meeting should decide this issue. A number of Supreme Court justices gave a written request for a full court meeting to discuss press statements of chief justice Sajjad A. Shah. Seven out of eleven judges signed the request and Mian set the date of October 13 for full court meeting. Sajjad A. Shah cut short his visit and dashed back. He cancelled the meeting, shuffled the roster and sent some of the rebellious justices for sittings in Lahore and Karachi. Another request of a full court meeting signed by seven justices was filed and chief justice rejected it by announcing his decision to the press. Now the conflict between supreme court justices was open and the game was played in the press. Six justices issued a press rejoinder and for the first time openly questioned the appointment of chief justice. Shah was fighting a two front war; one against the Prime Minister Nawaz Sharif and second against his own rebellious judges. (17) Shah belatedly called a full court meeting on October 17 but by that time the division among the justices was complete and all parties had crossed the point of no return. Chief Justice fired opening salvos against the Prime Minister Sharif by entertaining letters sent to him by opposition Pakistan Peoples Party members. One letter was sent to him by former defense minister Aftab S. Mirani on October 18 alleging that Sharif had favored a friend by giving him an import license. Another was sent by Senator Safdar Abbasi alleging that Sharif’s business house had acquired bank loans through political leverage. Another case of alleged illegal allotment of plot by Sharif and a petition challenging 14th Amendment (a hastily enacted amendment by Nawaz Sharif which prohibited members from voting against party line on any issue) was also entertained. In an astonishing move, four cases which could hurt Sharif were taken up by chief justice in a matter of two days. Chief justice asked the petitioners to hurry to his chamber within 72 hours to give their statements. He clearly conveyed the message that he was drawing the battle lines. In addition, using his authority as chief justice to set up rosters, he had sent all senior judges away from Islamabad and used ‘like minded’ junior justices for the benches to hear these cases. The message was now clear even to the blind that chief justice was positioning himself for sending the kind of fireballs which could prove fatal for Sharif. Chief justice stacked the deck against Sharif by comprising a three member bench headed by himself while the remainder two judges (Mukhtar A. Junejo and Bashir Jehangiri) were part of the chief’s loyal camp. Within a week the bench passed an interim order which prohibited action against any assembly member who violated 14thAmendment. Next day the same bench sent a note to the president ordering him to issue the notification of appointment of five Supreme Court justices recommended by chief justice. Sharif was counting on the rebellious justices of the Supreme Court before unloading his own ammunition. On October 21, six justices sent a protest note to chief justice and questioned his appointment. A copy of the note was also sent to the president. It was now Sharif’s turn and he showed his true colors when all kind of abuse was heaped up on chief justice both inside the parliament and in press statements. Contempt of court petitions were promptly filed against prime minister and some members of parliament and chief justice entertained them post haste adding another stone into his sling. For contempt hearing, chief justice comprised a three member bench which he presided. Later two more members were added. Chief justice had lined up his cavalry well and the four justices which he chose were a safe bet. Justice Bashir Jahangiri was on the same tune as chief justice. The other three justices; Muhammad Arif, Mamoon Qazi and Munir Shaikh had been elevated just few days earlier at the recommendation of chief justice against the wishes of the government. Shah was determined to humiliate Sharif by using his position of chief justice. On October 27, Shah took up the case of 14th Amendment and rejected government’s request of adjournment to study the case. On October 30, a three member bench headed by chief justice heard two petitions asking president to step in and issued a short order giving government thirty days to appoint five justices recommended by chief justice. In early November, chief justice shuffled the deck of justices when he decided to hear cases against Nawaz Sharif. He constituted two benches sitting in Islamabad. First was a three member bench headed by him (the other two Justices were Muhammad Arif and Bashir Jehangiri). The second was a two member bench of Justice Mukhtar Ahmad Junejo and Fazal Elahi Khan. Of five justices only one justice Fazal Elahi Khan was in the opposite camp thus the odds were four to one against Nawaz Sharif. On November 12, chief justice declined to appoint president’s nominee for acting Chief Election Commissioner (CEC) and instead appointed Justice Mukhtar A. Junejo. Sharif covered his bases by hurriedly passing a Contempt of Court Bill to protect himself in case chief justice decided to convict him. However, he was advised by his legal team to go for the ‘original sin’ and that was to question the appointment of chief justice three years earlier. On November 17, a petition was filed in Sindh high court challenging the appointment of chief justice. A similar petition was filed in supreme court registry in Quetta challenging the appointment of chief justice. Few days later, another petition challenging appointment of chief justice was field before supreme court registry in Peshawar. On November 26, 1997, a two member bench (Nasir A. Zahid and Khalil ur Rahman) sitting in Quetta issued an order that the issue of chief justice’s appointment should be forwarded to chief justice for a full court hearing. Few days later, another two member bench of the same court (Khalil ur Rahman and Irshad Hasan Khan) issued an unprecedented order suspending their own chief justice. Chief justice passed an administrative order suspending Quetta registry’s order which was received at Quetta in the evening. Justices in Quetta were at their rest house. The esteemed judges took up the case in the rest house and decided that chief justice’s order was null and therefore should be ignored. A two member bench (Saeeduzzaman Siddiqi and Fazal Elahi Khan) at Peshawar entertained a petition by an ally of Sharif challenging the appointment of chief justice. This bench decided that chief justice could not perform judicial and administrative functions therefore he could not suspend the bench’s order. In an unprecedented move, justice Saeeduzzaman Siddiqi issued order to the registrar of Supreme Court to place all cases before the senior most judge justice Ajmal Mian and asked Mian to constitute a full bench. When Mian declined, in another mind boggling development justice Saeeduzzaman himself ordered the constitution of the full bench of Supreme Court (excluding Justices Sajjad Ali Shah and Ajmal Mian) to deliberate on chief justice’s appointment. Sajjad A. Shah sent a letter to the president asking him to refer justice Saeeduzzaman Siddiqi to SJC for disciplinary action. President forwarded that request to prime minister to take appropriate action. With this open rebellion against chief justice, government announced that it will not accept any decision of chief justice Sajjad A. Shah in all the cases as he had become controversial. December 01, 1997 was the darkest day in the history of Pakistan’s judiciary. Two orders were issued for the constitution of benches; one by chief justice Sajjad A. Shah heading a five member bench for hearing the cases while the other by justice Saeeduzzaman Siddiqi heading a fifteen member bench to decide about the fate of Sajjad A. Shah. On December 02, two parallel courts were set up inside supreme court. Chief justice had hedged his bets and had two benches set up: one was a five member bench headed by him to hear contempt case against prime minister and another three member bench headed also by him to hear the constitutionality of 13th Amendment (this amendment had removed president’s discretionary power to dismiss prime minister and assembly). In the other room Justice Saeeduzzaman presided over the assembly of ten other justices to decide chief justice’s fate. Shah decided to go for the coup de grace. He sat on the bench hearing 13th Amendment, fired his final volley and announced an order suspending the 13th Constitutional Amendment which now freed president’s hand and allowed him to dismiss assembly. Attorney general rushed to the room next door and asked justice Saeeduzzaman to suspend the interim order passed by chief justice sitting next door. This bench was assembled to decide about the fate of Sajjad A. Shah and had no written request about any other issue. However in another unprecedented move justice Saeeduzzaman suspended the order of his own chief justice on verbal request from attorney general. Saeeduzzaman also issued order of restraining the chief justice and directed president to issue the notification of appointment of justice Ajmal Mian as acting chief justice. (18) In the meantime, the blood was also drawn at the presidency and president Farooq A. Leghari resigned and senate chairman Wasim Sajjad took the oath of acting President. In this conflict, the battle was quite ugly where cabinet ministers and members of national assembly passed derogatory remarks about judges and even stormed the supreme court building on November 28. Retired justice of Supreme Court Muhammad Rafiq Ahmad Tarar played the most despicable role of working with some judges of the supreme court and exploited the division among superior court justices to achieve desired results. One day prior to the order of two Supreme Court justices sitting in Quetta questioning the appointment of chief justice, Tarar flew to Quetta in a special plane accompanied by Shahbaz Sharif and met with these justices. 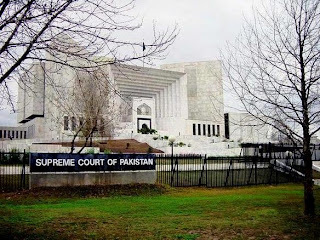 After an intense activity of palace intrigues, rebellious justices of the Supreme Court entertained a case against appointment of Sajjad A. Shah in Peshawar high court which was pending for over two years. Government acted on Supreme Court’s decision and denotified appointment of chief justice Sajjad A. Shah and relegated him as ordinary judge. Justice Ajmal Mian was sworn as new acting chief justice. A new chapter in judicial history was written in Pakistan which probably no other country can boast. A group of ten supreme court justices deposed their own chief justice and then nominated an acting chief justice among themselves. They excluded five brother judges who were viewed sympathetic to Sajjad A. Shah. An acting president then appointed an acting chief justice who was administered an oath by another Supreme Court justice Saeeduzaman Siddiqi who had taken upon himself to decide what was to be done. In an ironic twist, among the ten justices who decided that Sajjad A. Shah’s appointment was unlawful, eight had been administered oath none other than Sajjad A. Shah. Chief justice was perfectly legal when he administered oath to them but later they changed their mind. Another interesting fact was that justice Shaikh Riaz Ahmad was sitting on this bench who three years ago as federal law secretary had issued the notification of appointment of chief justice Sajjad A. Shah. Later in an interview, Saedduzzaman defended his action of working with government to boot out his own chief justice. (19) On December 23, 1997 Supreme Court ruled that their own chief justice who had already served for three years was chief justice no more and should be reverted to the position of a justice in Supreme Court (Sajjad A. Shah took a leave and retired). The decision had some serious legal ramifications such as what was the status of the decisions taken by Sajjad A. Shah as chief justice. The court bailed itself out by ruling that all decisions made by Sajjad A. Shah as chief justice would be valid using the doctrine of de facto. One last parting shot was fired by one justice sympathetic to Sajjad A. Shah. In the battle between chief justice and prime minister, president had become the casualty and had to resign. New president had to be elected and sworn in within thirty days. Justice Mukhtar A. Junejo was serving as acting Chief Election Commissioner (CEC) and in this capacity was also returning officer for the election of President of Pakistan scheduled for December 31, 1997. Nawaz Sharif’s candidate was Rafiq Tarar. On December 18, Juenjo entertained a petition filed by opposition Pakistan Peoples Party’s former minister Aftab S. Mirani. Justice Junejo rejected the nomination papers of Tarar stating that in view of Tarar’s previous derogatory remarks about judiciary made him ineligible to be elected to the parliament and henceforth he could not be elected president. An appeal was filed against the rejection at Lahore high court where chief justice Rashid Aziz Khan declaring conflict decided not to sit on bench. High court suspended CEC’s order and allowed Tarar to contest election. On December 28, Justice Junejo was booted out and acting president appointed justice Abdul Qadeer Chaudry as permanent CEC. In 1997, Pakistan surely wrote some new chapters in judicial history. A permanent president (Farooq A. Leghari) appointed an acting CEC but when it became inconvenient an acting president (Wasim Sajjad) now appointed a permanent CEC. Civilian and military rulers have been helped by eminent legal minds in judicial and constitutional matters. These legal celebrities change their own ideas depending on the situation. Governor General Ghulam Muhammad after dismissing Nazimuddin’s cabinet appointed A.K. Barohi as his law minister. Barohi was a strong advocate of a secular constitution and agreed with all those who wanted to keep religious leaders out of political arena. However when winds changed, then Barohi’s ideas also changed. Barohi later became legal advisor to General Zia and helped him to Islamize the country. Another bright legal mind is S. M. Zafar who had pleaded many cases of those in power. In 1997, while representing prime minister Nawaz Sharif in a contempt of court hearing, he argued that ‘another reason why the chief justice should drop the charges was that he was from Sindh and in Sindh there was a tradition that if someone comes to the house of a Sindhi, then all complaints against the guest were dropped’. (20) Very few lawyers can boast about presenting such arguments in defense of their clients in a court of law. Shareefuddin Peerzada is an old hand who is nicknamed ‘jadugar’ (magician). He has an unbeatable record of faithfully serving military rulers spanning almost the whole history of Pakistan including Ayub Khan, Yahya Khan, Zia ul Haq and Pervez Mussharraf. He has been gifted with the rare ability to pull different varieties of rabbits from his legal hat to fulfill the needs of military rulers. The conflict between judiciary and executive in 1997 showed that there was very little if any regard for the most important institutions of the state. The high office holders merely used their positions to fulfill their narrow personal interests rather than defending any high ideals. Prime Minister used his absolute majority in the parliament in a very irresponsible way by hastily enacting new laws and even amending the constitution without any serious debate. It made mockery of the whole concept of representative government. On the other hand, bitter infighting among Supreme Court justices and reckless attitude of the chief justice shocked everyone. Chief justice really became a loose canon acting way beyond the legal norms. In an unprecedented manner, he was issuing orders from the bench ordering the president to nominate justices which he had selected. He was also issuing and suspending executive orders and even suspending constitutional provisions in a cavalier manner simply to humiliate Prime Minister. A former chief justice Saeeduzaman Siddiqui long after his retirement pontificated that ‘by legitimizing military takeovers, the judges have abdicated their role to defend the constitution. (24) Siddiqui was the judge who colluded with the sitting government to oust his own chief justice. In addition, he served as chief justice for three month after General Mussharraf’s take over before being sent to the retirement wilderness . He conveniently forgot that during his tussle with chief justice, a number of senior lawyers came as mediators requesting supreme court judges to sort out their differences amicably to safeguard the sanctity of the institution of the supreme court but he went ahead and played a leading role in writing a sad chapter in the judicial history of Pakistan. Appointing judges as acting head of executives (Governor General, President, and Governor) gives some leverage to government. This practice has been followed for a long time in Pakistan. In 1950s, Munir served as acting Governor General when Ghulam Muhammad was away from country. Acceptance of positions in government during active service and openly joining politics after retirement also tarnishes the image of judiciary and creates doubts about their impartiality. Chief justice Muhammad Munir gave the historic decision of validation of General Ayub Khan’s martial law in 1958. Immediately after his retirement he accepted a government job in Japan. Later he also served as law minister during General Ayub’s rule. Political governments take care of their favorite justices even if they are pushed aside by their own brother justices. In 1996, Supreme court laid down guidelines for appointment to higher judiciary. This affected two retired justices who were appointed ad hoc justices of the Supreme Court and they were removed from Supreme Court. Benazir government obliged them by appointing one (Justcie Munir Khan) as provincial ombudsman and the other (Justcie Mir Hazar Khan Khoso) member of high powered Federal Public Service Commission. Justcie Irshad Hasan Khan served as federal law secretary during the Martial Law of General Zia. He later rose to become chief justice of the Supreme Court (January 26, 2000 - January 06, 2002). High court justice Ghaus Ali Shah joined Muslim League of Nawaz Sharif and served as Sharif’s confidant for long time. Supreme Court justice Afzal Lone was sitting on the bench which restored Nawaz Sharif government in 1993. Later he headed the Lone Commission which absolved Nawaz Sharif of any wrongdoing in the cooperative scandal. Later, Sharif paid Lone back by nominating him to become senator. Supreme court justice Muhammad Rafiq Tarar after his retirement served Sharif’s business interests and was later elected senator on Nawaz Sharif’s Muslim League ticket. He was duly rewarded by appointing him president for his loyal services. Tarar paid back by retaining his post when he agreed to general Mussharraf’s request to stay on as president when the later had booted out Nawaz Sharif and assemblies. Mussharraf in turn returned the compliment by unceremoniously sending Tarar home in June 2001. Tarar was booted out of the presidency by putting him in a private car and sent home in the most humiliating way. Mussharraff needed to act in this way not for a great national cause but he needed to get the lofty title of president to get the correct protocol during his upcoming visit to India. If one takes into account the relationship of various judges with their political patrons and their judgments on crucial cases, then some questions arise about the motive of their judgments. Justcie Tarar saw everything wrong with Nawaz Sharif dismissal by president in 1993 and was as one of the justice of the Supreme Court bench which decided to restore Sharif government. Justcie Sajjad A. Shah saw everything wrong with Benazir’s dismissal in 1990. He was one of the two dissenting judges (the other one was Justcie Abdul Shakurul Salam) in a 1991 decision who did not approve of president’s decision to dismiss Benazir. He wrote that president had exercised his power with ‘malafide intention’. (33) In 1993, Shah saw everything right with Sharif’s dismissal and was the lone dissenter in a ten to one decision of Supreme Court which restored Sharif government. In 1997, when his relations had gone sour with Benazir, he viewed dismissal of Benazir kosher and even called president’s discretion of sacking prime minister as a balance of powers and ‘a safety valve to prevent imposition of martial law in the country’. (34) When president dismissed Benazir government in 1990, the dismissal was challenged in courts. Peshawar high court bench dismissed the petition by majority but justice Qazi M. Jamil was the dissenting judge. Jamil was also on the bench which restored provincial assembly. For these ‘crimes’, he was not confirmed by the president. Benazir duly rewarded Qazi M. Jamil by appointing him attorney general during her second term. Chief justice Nasim H. Shah’s favorable tilt towards Muslim League and his antipathy towards Pakistan Peoples Party were well known. He had exchanged harsh words with chief justice Muhammad A. Zullah when later received Benazir at a function when she was opposition leader. He headed the bench which restored Sharif government in 1993. He had been humiliated earlier during Benazir government when Benazir refused to sit on the same table with him. The reason was that Nasim H. Shah was one of the justices who had upheld the death sentence of Benazir’s father Zulfiqar Ali Bhutto in 1979 (Nasim H. Shah was one of the majority justices on the bench which had given a four to three verdict of rejection of appeal of death sentence). When chief justice Sajjad A. Shah was booted out by his own brother judges, the new court decided to clear up some contentious issues. All cases involving government and Prime Minister were dealt with judgments favorable to the government’s position. In March 1998, a seven member bench dismissed the petition challenging the 13th Constitutional Amendment. Interestingly, the petitioner was now not enthusiastic about perusing the case which suggests that the petition was part of the tussle between then chief justice (Sajjad A. Shah) and Prime Minister (Nawaz Sharif) and after the ouster of chief justice no one was interested in it. In May 1999, the court acquitted all who were charged with contempt of court including prime minister and several members of parliament. After the dismissal of Nawaz Sharif’s government an appeal was field against acquittal in September 2000. A five member bench of supreme court heard the appeal and convicted seven accused of contempt of court sentencing them to one month imprisonment and 5000 rupees fine. (35) Such decisions only degrade the image of judiciary and average citizen loses faith in the institution. Corruption is systemic in all institutions of the country and lower levels of judiciary are rife with corruption. Pakistani society in general and especially the ruling elites are obsessed with petty protocol issues and judiciary is no exception to this trend. Genuine disagreements are seen as personal affronts and humiliating others is seen as a justifiable response. Justice S. M. A. Samdani served as law secretary during Zia’s military rule. During a meeting, there had been some skirmish between the two. In 1981, when new oath was administered to judges, Zia told Punjab Governor Lieutenant General Ghulam Jilani not to offer oath to Samdani who had arrived all dressed up to take the oath but went home disappointed. (36) Zia took his revenge by insulting a high court justice while the judge having no scruples to serve a military regime wanted to also play the cowboy by locking horns with generals. Sometimes people occupying high offices act in a childish manner embarrassing not only the high office but also the country. In August 1997, chief justice recommended elevation of five judges to supreme court without consulting with government. Government in return issued an order duly signed by the president reducing the strength of the supreme court from seventeen to twelve. Few days later chief justice presiding a three member bench suspended the notification and a couple of days later government withdrew the notification. Supreme Court justices rather than brainstorming about legal issues clashed with each other about the color of the Supreme Court flag. One chief justice arranged for the inauguration of the incomplete building of the new Supreme Court because he wanted to be in the limelight before his retirement. A number of justices opposed this ridiculous idea and they were not invited for the ceremony. When chief justice Muhammad Afzal Zullah received opposition leader Benazir Bhutto in a ceremony, several of his brother judges were furious and harsh words were exchanged between Zullah and justice Nasim Hasan Shah. In 1997, when rebellious judges confronted chief justice Sajjad A. Shah in a meeting, there was plenty of name calling. Shah accused justice Shaikh Riaz for working on behest of the government as he was friendly with Shahbaz Sharif. Riaz retorted that when he was serving as chief justice of Lahore high court, Shah had asked him to arrange for a meeting with Nawaz Sharif’s father Mian Muhammad Sharif (he used the words ‘qadam bosi’ (kissing the feet) of Sharif’s father) and Riaz had arranged for that meeting. (41) In his petition challenging president’s reference against him, chief justice Iftikhar M. Chaudry has spilled some more judicial beans and few more skeletons have seen the daylight. Chaudry accused several justices of the SJC as biased because he had initiated inquiries against their misconduct. He objected on inclusion of three justices: Javed Iqbal, Iftikhar Hussain Chaudry and Abdul Hameed Dogar. He maintained that justice Iqbal will benefit from his removal and may have a shot at chief justice post in three years. (42) He also accused justice Iqbal of securing admission for two of his daughters to medical college on special quota when they did not qualify on merit. He stated that he had sent a reference to SJC against justice Abdul Hameed Dogar for mismanagement of funds of Shah Abdul Latif Bhitai University. He also disclosed that another member of SJC, chief justice of Lahore high court Iftikhar Hussain Chaudry was not on talking terms with him since he had opposed his elevation to supreme court. (43) The cats which Chaudry has let loose are going to cause a lot of problems. He should expect some backlash from people he is accusing. Date of birth can be very important especially when one’s promotion and retirement depends on it. The clash of dates of birth of two chief justices is elaborated in detail in their autobiographies. (44) Sajjad A. Shah was scheduled to retire on February 16, 1998 on attaining the age of 65 which was the age of retirement for supreme court justice. In a totally bizarre move, he sent an application to the president of Pakistan stating that the date of birth recorded on all his records was wrong. He stated that he had found his correct date of birth just few years ago. He requested that his date of birth should be changed from 16 February 1993 to 10 May 1934 and on the basis of this new information he should be retired on 10 May 1999 instead of February 16, 1998. (45) Justice Mian was more smarter and quite early in his career he had fast forwarded his date of birth and secured appropriate documents. Such petty things when come to limelight further erodes the respect for judiciary and institution suffers badly from these acts of omission and commission. In every country, appointment of judges is sometimes a contentious process and government strives to install like minded judges. Same is true in case of Pakistan and every government has tried to appoint judges who are viewed in favorable light; however in the process legal limits have been stretched to the extreme. In June 1954, Ghulam Muhammad appointed justice Muhammad Munir as chief judge (the title was later changed to chief justice) of Supreme Court. Normally senior most judge is appointed to the post. At that time the senior most judge was Abu Saleh Muhammad Akram who was a Bengali. He gave a written note waiving his seniority rights. (46) In 1976, Prime Minister Zulfiqar A. Bhutto appointed justice Aslam Riaz Hussain who was number eight on seniority list as chief justice of Lahore high court. The senior most justice Maulvi Mushtaq Hussain who expected to be the chief justice never forgot that insult. Bhutto also extended the tenure of chief justice Muhammad Yaqub by enacting a constitutional amendment. The next senior justice Anwar ul Haq who was expected to succeed Yaqub felt aggrieved. In an ironic twist of fate, three years later justice Maulvi Mushtaq Hussain (now chief justice of Lahore high court) presided a bench of high court which sentenced Bhutto to death for ordering the assassination of a political opponent. Justice Anwarl ul Haq (now chief justice of Supreme Court) presided the bench of Supreme Court which upheld Bhutto’s death sentence. In 1994, when Benazir was considering Sajjad A. Shah for the post of chief justice, Benazir’s husband Asif Ali Zardari told Sajjad that government will nominate him on the condition that he sign on a written resignation without date to be used in case he decide otherwise. Justcie Sajjad A. Shah was smart enough to refuse to hand over the very sword to Benzair which could cut off his own head anytime. In Pakistan, executive has tried to use all legal loopholes to influence the outcome of a case. Justice A. R. Cornelius (he was the sole dissenter in the case which upheld Governor General’s decision to dismiss constituent assembly) stated that he was convinced that in 1955, ‘Ghulam Muhammad had pressured and influenced the other justices during the time the case was being argued before the court’. (47) Government sometimes shuffles the deck of justices sitting on the bench to make sure that it’s case prevails. The case of challenge of dismissal of constituent assembly by Maulvi Tamizuddin in 1955 is a good example. In 1955, The supreme court panel included chief justice Muhammad Munir and justices A. S. Akram, A. R. Cornelius, Khawaja Shahabuddin and Muhammad Sharif. Justice Sharif had worked under Munir at Lahore high court and was considered his protégé. Cornelius and Shahabudin were considered independent minded judges. The constitution of the bench showed that Munir and Sharif will accept Governor General’s argument while Cornelius and Shahabudin may not accept it. Akram was not a strong judge and may side with either group. Akram had already buckled when he waived his seniority in favor of Munir for the post of chief justice. This was considered a level ground for both parties. When the case moved through Sindh high court, Government assigned Shahabudin as acting Governor of East Bengal (This was unusual as in the absence of governor, normally the chief justice of the high court fills the post of acting Governor). He was replaced with S. A. Rehman who was considered to be in line with Munir’s thinking. (48) Now the odds were four to one in favor of government and this proved to be correct in the final judgment. Benazir’s first stint as prime minister was short-circuited when president sacked her in August 1990. Petitions were filed against the president’s decision. On September 26, 1990, Peshawar high court set aside governor’s order and restored provincial assembly. Federal government got the judgment suspended via justice Usman Ali Shah of Supreme Court who happened to be in Peshawar. In Karachi, constitutional petitions challenging the president’s order were filed in the high court. Chief justice Sajjad A. Shah set up a five member bench headed by him to hear these petitions on September 24. Government had reservations about justice Sajjad A. Shah, who was on friendly terms with Benazir’s family. On September 19, he was made acting governor of Sindh when governor Mahmud Haroon went for a few days religious trip to Saudi Arabia. The trip normally lasts 3-4 days, however Haroon developed ear pain for which he had to stay longer. Justcie Saeeduzzaman Siddiqi was appointed acting chief justice and headed the bench which heard the petition and as expected unanimously dismissed it on October 18, 1990. (49) When the objective was achieved, real governor came back home and Sajjad A. Shah reverted to become chief justice of the high court and few days later kicked upstairs and appointed justice of Supreme Court. On April 18, 1993, president dismissed Nawaz Sharif’s government. A constitutional petition came for Supreme Court hearing. Chief justice Nasim Hassan Shah and justice Muhammad Rafiq Tarar’s sympathetic views towards Nawaz Sharif were known. During the hearings, both judges would ask other judges about their views on the merits of the petition. The judgment was announced on May 26, 1993 and Nawaz Sharif government was restored. The judgment was ten to one and the sole dissenter justice was Sajjad A. Shah. In his dissenting note, he wrote that ‘seemingly it so appears that two Prime Ministers from Sindh were sacrificed at the altar of Article 58 (2) (b) of the Constitution but when the turn of the Prime Minister from Punjab came, the tables were turned’. (50) The ethnic factor was now quite visible even in the highest court of the land. All incumbent governments whether civil or khaki have manipulated the timing of oath taking ceremony to tinker with seniority question. In 1985, justice Ajmal Mian was appointed acting chief justice of Baluchistan high court. Immediately after the ceremony, chief secretary Salim Abbas Jilani conveyed the message of governor and Martial Law Administrator Lt. General K. K. Afridi to him that the two newly nominated judges of high court should be administered oath on separate days. Governor wanted that oath should be administered to justice Munawwar Mirza one day before justice Mir Hazar Khan Khoso. (51) This would give seniority benefit to Mirza. The case of justice Abdul Hafeez Memon is a good example of how executive manipulates the system to get desired results. In December 1989, during Benazir’s first term as prime minister, Memon was elevated as acting justice of supreme court. Administration of oath for newly appointed judges of supreme court was tinkered with to give the favor of seniority to one judge (Memon). Memon was administered oath on December 12, 1989 while justices Ajmal Mian, Abdul Qadeer Chaudry and A. S. Salam on December 13 and justice Rustum Sidhwa on December 14, thus giving seniority advantage to Memon (52) After dismissal of Benazir government in 1990, justice Memon was reverted back to Sindh high court. During Benazir’s second term, she didn’t get along well with chief justice Nasim Hasan Shah because of latter’s sympathies with Nawaz Sharif. On April 14, 1994, the day Nasim H. Shah retired, a notification was issued about elevation of Memon as chief justice of Sindh high court and he was administered oath promptly. Government now found that he would be 62 years old which is the age for retirement from high court. Another notification was issued by which Memon was appointed judge of supreme court because the age of retirement for Supreme Court justice is 65 years and then sent to Sindh high court as acting chief justice. Chief justice of Lahore high court Justcie Mehboob Ahmad was appointed during Nawaz Sharif time. When Benazir came to office, a notification was issued to send justice Mehboob to Federal Shariat Court. Mehboob declined and stood retired. During Benazir’s first term, Qazi M. Jamil was appointed justice of Peshawar high court. He was sitting on the bench which heard the petition of Benazir’s dismissal in 1990 and dismissed it by a majority decision. Jamil wrote the dissenting note, therefore he was not trusted by Nawaz Sharif government and was not confirmed. During Benzair’s second term, Jamil was paid back by appointing him attorney general. In 1996, Supreme Court entertained a constitutional petition regarding appointment of judges. Government knew about the court’s judgment which laid down some rules about appointment of justices prior to its announcement. One day before the date of announcement of the judgment, government confirmed ten additional judges of Lahore high court and seven additional judges of Sindh high court prior to their due dates. Chief justices of both courts administered oaths on the same day and some judges were administered oaths early in the morning of the day of announcement of supreme court decision. (53) This was done to secure the position of justices which government favored and save some of them from coming under the clout due to Supreme Court’s decision. Appointing judges as acting rather than permanent is another instrument used by government to influence judiciary. General Zia ul Haq used this instrument frequently to keep judiciary in its place and avoid any embarrassment through the courts. Benazir’s second stint as prime minister gives a glimpse of the abuse of this exercise. In April 1994, when Nasim Hasan Shah retired, Benazir government appointed justice Sad Saud Jan as acting chief justice. Jan was the senior most justice and expected to become permanent chief justice but Benazir was leery about him and was not sure whether he would accommodate government as desired. Sindh high court was functioning with a permanent chief justice Nasir Aslam Zahid who apparently did not get along well with provincial government. Justice Abdul Hafeez Memon was appointed as acting judge to Supreme Court by Benazir in her first term but was dropped when her government was dismissed in 1990. In the new game of chess, Memon was elevated to Supreme Court as permanent judge but after administration of oath sent to serve as acting chief justice of Sindh high court. The permanent chief justice of the court justice Nasir Aslam Zahid was sent to Federal Shariat Court, a wilderness area for judges. In 1995, permanent chief justice of Lahore high court Mian Mehboob Ahmad was sent to Federal Shariat Court (he declined and stood retired) while Supreme Court justice Muhammad Ilyas (who was nominated to Supreme court after his retirement from high court) was deputed acting chief justice of Lahore high court. In January 1995, when chief justice of Peshawar high court retired, government appointed justice Ibne Ali as acting chief justice. At one time, three of the four high court chief justices were acting rather than permanent. In March 1996, Supreme Court issued judgment outlining some basic principles for the appointment of judges to higher courts. Government rather than implementing the recommendations decided to embark on the game of hide and seek. Justice Mamoon Kazi who was serving as ad hoc judge in Supreme Court was supposed to revert back to Sindh high court and justice Nasir Aslam Zahid to go back from Shariat Court to assume his previous post of chief justice of Sindh high court. Government instead elevated Zahid to Supreme Court and appointed Kazi as chief justice of Sindh high court without even informing chief justice Sajjad A. Shah. Governor of Sindh administered oath to justice Kazi. When Zahid came to Islamabad to be administered oath by chief justice, the furious chief justice refused to administer oath. This was an embarrassing situation. Two supreme justices (Ajmal Mian, Salim Akhtar) and justice Zahid himself pleaded with chief justice not to pick another fight with government and he relented. (54) Such ill thought and short sighted policies of government belittles its own image and creates fissures in the judiciary. Pakistan’s judicial history has seen its ups and downs. In the last sixty years, the independence and prestige of the judiciary has been gradually eroded. Current crisis is just another downward trend. Clearly the decision taken by General Mussharraf to sideline another chief justice has gone out of control. Chief justice Chaudry has emerged as a hero for confronting the arbitrary powers of the executive and army chief. Frustrations of people related to political, economic and security problems have found an avenue and many who would have cared less of what happens to the chief justice are using this opportunity to express these frustrations. Political parties who have their fare share in the present sorry state of the judiciary are now championing the cause of independence of judiciary. The issue is now not mere a simple legal or administrative one but has other complicating factors which are essentially political. It is not clear at present what course government will take. There are only two options available for general Mussharraf: working by all means to shunt out chief justice or reconciliation by taking back the reference against him and allowing him to return as fully functional chief justice. Both options are marred with many complications both for general Mussharraf and the country. If Mussharraf decides to double his bets, he may add new charges of politicization of chief justice office by Chaudry and dig out some more dirt against him. All of us have a number of skeletons in our closets and intelligence agencies keep a register of those skeletons. New ‘sins’ of chief justice may be added to the formal charge sheet or simply leaked to the media to catch some ground and then government will try to get a favorable verdict from the full bench of the Supreme Court. If this approach is taken then government will have to work on judges on the bench using carrots and sticks. Carrots are plenty while the stick may include an old legal loophole to ask judges to take a fresh oath and government will use this opportunity to sideline undesirable judges on the bench. There is another door which is open for the government. When Iftikhar M. Chaudry was elevated to chief justice post, his appointment was challenged by justice Falak Sher of Supreme Court on grounds that Chaudry was not the senior most justice at the time of his appointment. That petition is still lying in the dark corners of the Supreme Court and government may decide to use it. There is a precedent of the removal of chief justice in this manner when in 1997, chief justice Sajjad A. Shah was removed after three years by his brother justices. However at that time, majority of justices of Supreme Court rebelled against their own chief justice. In current circumstances, although some justices have grievances against chief justice however in view of public mood not too many justices will be willing to follow that example. Justices of the Supreme Court are under tremendous pressure from various quarters. If the charges against chief justice are not serious, it is very likely that the Supreme Court bench may exonerate him creating a new challenge for general Mussharraf. If Mussharraf withdraws the reference and allows the chief justice to assume his office without any penalty then it will significantly undermine the authority of general Mussharraf. In addition, chief justice has a long way to go before his retirement and he will be the unpredictable factor limiting room of maneuver for general Mussharraf. Mussharrf is not likely to follow this path and will not be comfortable leaving a ticking bomb at such a high place as chief justice of Supreme Court. A more likely outcome is a behind the scene deal where some face saving option is given to the chief justice and he is eased out of his current position. Later when the dust settles, he can be compensated in some way. An essential element of all these options is to prevent linkage of chief justice issue with other political and social issues and government will like to use all available means to prolong the process hoping that the protest fizzles out. If political violence gets out of control then as a last resort general Mussharraf may decide to wind up the whole civilian façade and restart from scratch. No matter how the current crisis ends, general Mussharraf will come out of it much bruised and weakened. The only real pressure on general Mussharraf can only come from the senior brass of the military. Even mild criticism or gentle prodding from this group will force general Mussharraf to rethink his strategy. In the current crisis there is no winner and everybody including government, general Mussharraf, judiciary, chief justice Chaudry and lawyer community are all losers. The most damaging effect has been on society in general. General Mussharraf’s action was reckless and equally crude was the response of the lawyer community. The rowdy and uncivilized behavior of lawyers significantly lowered their prestige. Rival lawyers using abusive language and manhandling their opponents in front of cameras is a new low for this community. Some bar association leaders threaten to revoke membership of those lawyers who represent government in the case. One lawyer Malik Muhammad Qayyum has approached Supreme Court against the presidents of Lahore and Multan bar associations who had called Qayyum a traitor and threaten him with suspension of his membership. (55) Chief justice Chaudry won the respect of majority of population but he fell victim to his own compulsions and lost his composure. He has significantly undermined his own position by openly attending rallies organized by political parties. He looks more like a politician and it is unlikely that he can perform as an independent and neutral justice if he returns to Supreme Court. Reckless attitude of law enforcement agencies in dealing with the protesting lawyers gave another blow to the legal profession and state institutions. Seeing the pathetic state of state institutions including the judiciary, it is no surprise that common man will be more inclined to take his case to tribal council, political party apparatus or assertive clergy rather than approaching a court of law. The fragility of the state and its pillars has become quite obvious and general populace has lost any hope of redressing their grievances through these normal channels. In such an environment, the appeal of non-state actors and sub national forces whether religious, sectarian, ethnic or tribal increases dramatically. These forces will gain at the expense of the state authority and they are the only winners in present standoff. Current crisis removed another chip from the pillar of legitimacy of not only the rulers but also the state and its institutions and is another step towards fragmentation of the state and society. 10- Quoted in Iqbal Akhund. Trial & Error: The Advent and Eclipse of Benazir Bhutto (Karachi: Oxford University Press, 2000), p.
Dr. Hamid Hussain is an independent analyst based in New York. For comments & critique humza@dnamail.com. His website is www.viewsonnews.net.